On March 22, Washington Gov. Jay Inslee signed a bill that is designed to increase the development and use of renewable natural gas (RNG) within the state. The Coalition for Renewable Natural Gas is among the groups that supported the legislation. On March 20, the U.S. Energy Information Administration announced U.S. manufacturers of densified biomass fuel reported producing 650,000 tons of product and selling 790,000 tons in December. In mid-March, the U.S. EPA awarded $1.8 million to six small businesses to develop technologies that provide solutions for environmental issues. 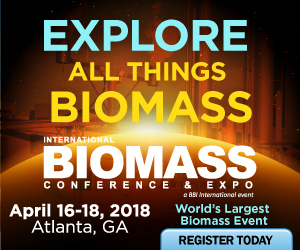 Two of the six companies are developing biomass-fueled thermoelectric stoves. The USDA has released a new report that measures economic growth, job creation and household income from biofuel and bioenergy production, along with future growth in renewable chemicals and biobased products. The U.S. EPA has released renewable identification number (RIN) generation data for February, reporting 1.4 billion RINs were generated during the month, including approximately 20.36 million cellulosic RINs. Non-profit, Global Green announced March 23 it will select two Southern California cities as partners to participate in a new food waste recycling program, using an Eco-Ambassador resident outreach model. Funded by a U.S. Department of Energy grant, a team of researchers at Worcester Polytechnic Institute is creating a better way to convert waste food into biofuels using a process that features catalysts and hydrothermal liquefaction. Researchers at the U.S. Department of Energy Joint BioEnergy Institute and Lawrence Berkeley National Laboratory have discovered a new enzyme that will enable microbial production of a renewable alternative to petroleum-based toluene. Researchers at Tufts University have created a genetically modified yeast that can more efficiently consume a novel nutrient, xylose, enabling the yeast to grow faster and to higher cell densities. Sino-Thai Engineering and Construction Public Co. Ltd. has awarded Pöyry with the engineering services assignment for Chana 20.6 MW net biomass power plant project in Chana District, Songkla, Thailand. Cool Planet has announced the successful completion of its 100th quantifiable, independent trial of Cool Terra, the company’s flagship soil health product. The trial was conducted by the University of Florida on bell peppers. Agrisoma Biosciences Inc., an agricultural technology company that sells Carinata seeds used to produce biojet fuel for the aviation industry, announced March 12 it has completed a CAD $12 million investment round. California can reduce carbon emissions by more than 70 million metric tons by 2030, akin to taking 15 million gasoline-powered cars off the road in one year, by adopting a higher target for its Low Carbon Fuel Standard, according to a new report. The purchase includes a 63-acre complex consisting of a 45 MMgy renewable jet/renewable diesel production facility, 1.7 million barrels of product storage, a truck rack with 28,000 barrels per day of throughput capacity, rail storage and pipelines. Enerkem Inc. recently announced that it has produced a new high-performance biofuel that could improve the octane rating of fuels sold on the market and reduce their carbon footprint. The fuel has a research octane number (RON) of up to 112.